^^In Revisiting Relational Youth Ministry, Andrew Root explores the origins of a dominant ministry model for evangelicals, showing how American culture has influenced our understanding of the incarnation. Drawing from Dietrich Bonhoeffer, whose work with German youth in troubled times shaped his own understanding of how Jesus intersects our relationships, Root recasts relational ministry as an opportunity not to influence the influencers but to stand with and for those in need. True relational youth ministry shaped by the incarnation is a commitment to enter into the suffering of all, to offer all those in high school or junior high the solidarity of the church. 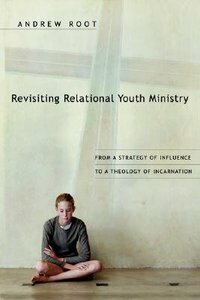 - Publisher Andrew Root reviews the history of relational/incarnational youth ministry in American evangelicalism and recasts the practice as one of place-sharing, not so much earning the right to be heard as honoring the human dignity of youth and locating God in their midst. About "Revisiting Relational Youth Ministry"
Andrew Root reviews the history of relational/incarnational youth ministry in American evangelicalism and recasts the practice as one of place-sharing, not so much earning the right to be heard as honoring the human dignity of youth and locating God in their midst.